This delightful early Tudor chapel was built to serve as a mortuary chapel for the Audley family. The chapel features a marvellous hammerbeam roof, with carved and intricately decorated timbers, and numerous fine memorials to members of the Audley and Walden families. Among the many excellent memorials is that of Sir Henry Audley (d. 1648), who lies propped up on one elbow, flanked by classical urns, while below him are ranged his children. In the churchyard outside the chapel is the grave of James Ward, a seaman who sailed the world with Captain Cook aboard the HMS Resolution. Ward is credited with being the first aboard the Resolution to spot the islands of Hawaii in 1778. The church of St Michael was built in the 14th century and rebuilt around 1500. 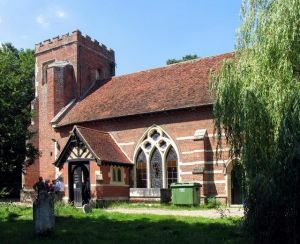 It was long ago declared redundant and sold on to serve secular purposes, but the Audley chapel was preserved for posterity and is now cared for by the Churches Conservation Trust.